Inpatient and ambulatory surgery is located on the third floor of the Bridwell Tower. 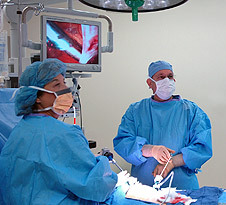 There are 14 operating suites, many designed specifically for computer-assisted procedures. Computerized navigation system for total joint replacements. Computerized navigation system for neurosurgical procedures. da Vinci Robotic Surgical System, for use in urological, gynecological, general, and certain other surgeries. Hybrid endovascular suite, which combines endovascular, cardiac surgical, laparoscopic, and radiological capabilities, allowing flexibility and speed in the treatment of patients with the most complex cardiac and vascular conditions. The suite can accommodate minimally-invasive cardiovascular procedures and then convert into an open heart surgical suite if the need arises. To find a surgeon in one of these specialties, please visit our Physician Directory, or contact United Regional Call-a-Nurse at (940) 764-8570 or (800) 982-9799.